It's dangerous to go alone. Take Link! Exclusive 20-inch tall limited edition Link action figure! Link as he appears in The Legend of Zelda: Skyward Sword. Extra-shiny metallic paint on his Hylian Shield and Master Sword you won't find anywhere else! Packaged like the classic golden Zelda cartridges for the NES and Nintendo 64. Don't take on Ganon with anything less! Entertainment Earth Convention Exclusive! You may have saved Hyrule, but have you done it with the best possible weapons and armor? 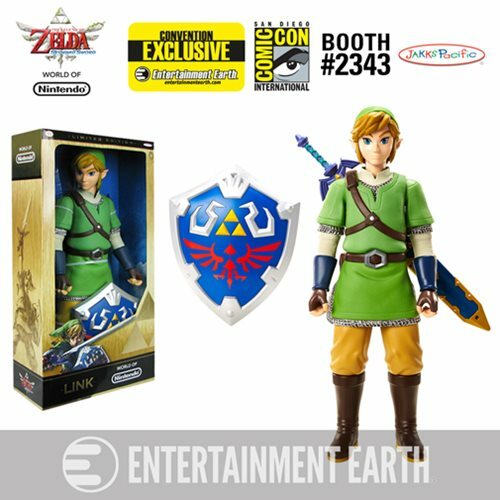 You can now with this limited edition The Legend of Zelda: Skyward Sword Link Variant 20-Inch Premium Action Figure - Convention Exclusive, featuring Link as he appears in the Nintendo Wii game The Legend of Zelda: Skyward Sword! This exclusive variant stands above the rest with premium metallic silver chainmail you won't find on any other Link figures at this scale, plus rich gold trim on his scabbard, shiny metallic silver buttons, and his traditional green outfit. Link's amazing metallic Hylian Shield sports a golden Triforce, exquisite detailing, and a special gold and silver paint job not available anywhere else! His Master Sword is painted to match. Link comes packaged in a stunning golden box, just like the classic golden Zelda cartridges for the NES and Nintendo 64. This Legend of Zelda Link Variant Figure - Convention Exclusive is the biggest and best version of Nintendo's iconic hero you can buy, so don't take on Ganon with anything less. Get it before it's gone, and remember these words of wisdom from Hyrule: "If all else fails, use fire!" The courageous Hylian hero of the video game series The Legend of Zelda is always clad in green, and while he wields everything from bows to shields to boomerangs, his weapon of choice is the Master Sword. Link's ears are pointed, and though he's honorable and unrelenting in his pursuit of justice, he also has a playful side. There have been many Links reborn throughout the ages, but all carry the Triforce of Courage within themselves. Link often starts out as an ordinary kid, but his destiny is always intertwined with Zelda and Ganondorf, the holders of the Triforces of Wisdom and Power, respectively.